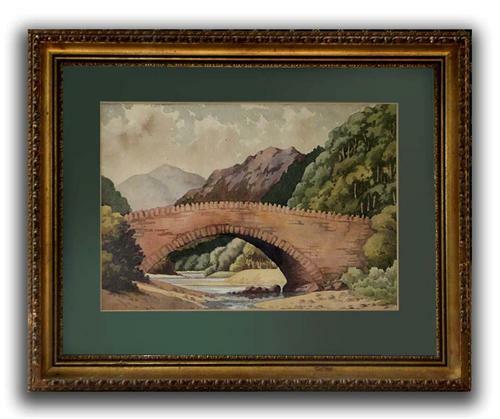 This is an extremely well painted watercolour entitled 'Bridge on the Moor' (no note as to which particular moor), based on the artist's Somerset address I'm opting for Dartmoor. It is very well and suitably framed, the dark moss green window mount works well with both the colouring and the subject matter of the painting. And there is a bonus extra on the reverse of the watercolour. A rather pleasing scene which is remaniscent of the Lake District. The date is my best guess.